Jack Tannehill, a longtime editor and owner of the Newton County Appeal, sold his paper to Jackson-based publisher Wyatt Emmerich. Both Emmerich and Tannehill are former presidents of the Mississippi Press Association. In fact, both are fathers were, too. The sale of the paper comes three years after Tannehill expanded the scope of the former Union Appeal upon the closure of the Newton Record, which Montgomery-Ala.-based CNHI shuttered during the depths of the economic recession. Tannehill is a well-known member of the Association. And one we will certainly miss. What a difference a week makes. Our last post, entered one week a ago, was a roundup of editorial voices from across Mississippi. A choir of near universal appreciation for the ex-governor on the eve of his departure from office, as it were. Seven days later, nearly a foot of fallen rain and one inauguration later, all anyone is still talking about is Haley Barbour. The mass pardoning has caused not only an uproar at home, it has been grist for the mill nationwide. And, once again, not the kind of attention Mississippi wants or needs. Sid Salter, syndicated columnist and author: This isn’t a public reaction born out of numbers. It’s a reaction born out of anger and, for many, a sense of betrayal. Newspapers which two days earlier had written glowing farewell editorials about Barbour were questioning his reasoning and his competence in the execution of the pardons. Angry families of the victims were questioning his sanity, his compassion, and his sense of decency. Lloyd Gray, editor of the Northeast Mississippi Daily Journal: Phil Bryant was inaugurated as Barbour’s successor Tuesday, but the overshadowing story of the week was the outgoing governor’s pardon barrage. It was truly one of the most perplexing political developments in Mississippi in years, and it almost immediately turned into a national story. One from Yours Truly on the overlooked public notice aspect: This isn’t about whether any one of the individuals Barbour pardoned was worthy or not. That’s another debate and one that’s usually rendered moot by the chief executive’s right to release convicts and restore their civil rights. Rather, this is about transparency and the public’s right to know. The Commercial Dispatch in an editorial as the pardon scandal was first breaking: Trials can be painful, and jurors struggle internally to make the right decision. All for naught. 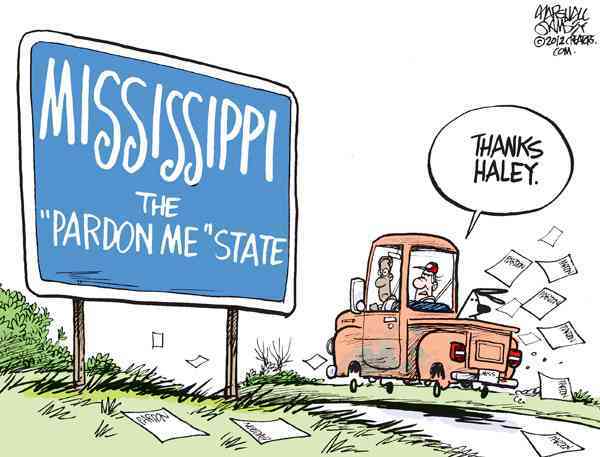 These lame-duck pardons have become a part of the fabric of Mississippi. It’s a piece we’d like to see torn out. A Daily Leader editorial: Political ramifications aside, the especially troubling aspect of this pardon episode is the fact that laws requiring public notices were blatantly not followed. The Mississippi Constitution – the document that gives governors the right to grant pardons – also states that no pardon can be granted unless notice of the impending reprieve is made public for 30 days prior to the issuance of the pardon. The notice must be published in a newspaper located in the county where the conviction occurred. David Hampton, editorial director of The Clarion-Ledger: Gov. Haley Barbour returns to private life this week, leaving a legacy of one of Mississippi’s strongest governors during one of Mississippi’s most difficult times. Jack Tannehill, editor and publisher of The Newton County Appeal: He has been unwavering in his attempts and his success to keep a blanket over everything that revealed anything personal. But, for me, the most seminal moment of the Barbour years was a brief lifting of that veil that I think reveled more about Barbour, the person, than any other event during his time in office. Charlie Mitchell, syndicated columnist: Barbour showed no mercy in blaming Musgrove for the state’s money mess eight years ago, but has artfully dodged any responsibility for job losses, tax shortfalls and reduced funding for education and other state responsibilities since 2008. And while so doing he has prevailed on legislators to go slow in allocating bailout funds and draining the state’s reserve, which was replenished starting in his first budget year. Lloyd Gray, editor of the Northeast Mississippi Daily Journal: He was a Washington powerhouse before he returned to Mississippi to serve two historically significant terms as governor, and he brought Washington here with him. He brought all the contacts he had developed in his years as a White House aide, Republican national chairman, lobbyist and political strategist, which has benefited the state. He also brought Washington-style partisan politics, which changed the dynamics in state government and ultimately its control. Sid Salter, syndicated columnist: The majority of Mississippi — a majority that twice elected Barbour governor — will remember him much as the rest of the country remembers him. They will recall his strong, decisive leadership in the wake of Hurricane Katrina and other disasters, and they will remember him for leaving the state’s Republican Party not merely competitive in the two-party system, but dominant. The Sun Herald editorial board: Barbour’s singular role in helping South Mississippi cope with, and recover from, Hurricane Katrina will long remain the stuff of gubernatorial legend.